So with all the Halloween Events that In the UK is co promoting this year, we are also going to run a Halloween Offer alongside. Its easy to enter purchase a Ticket through any of the co promoted links and have the chance to get your ticket price refunded when you share, Re-Tweet any event post or blog post on any of our Social media channels making sure that you tag the In the UK account on that platform (Facebook – Twitter). This can also include any of the regional Twitter accounts. We will run the Halloween offer until the end of the 31st October 2017, announcing the Winner by the 2nd November, contacting them through the social media channel that they used to share or Re-Tweeted with. 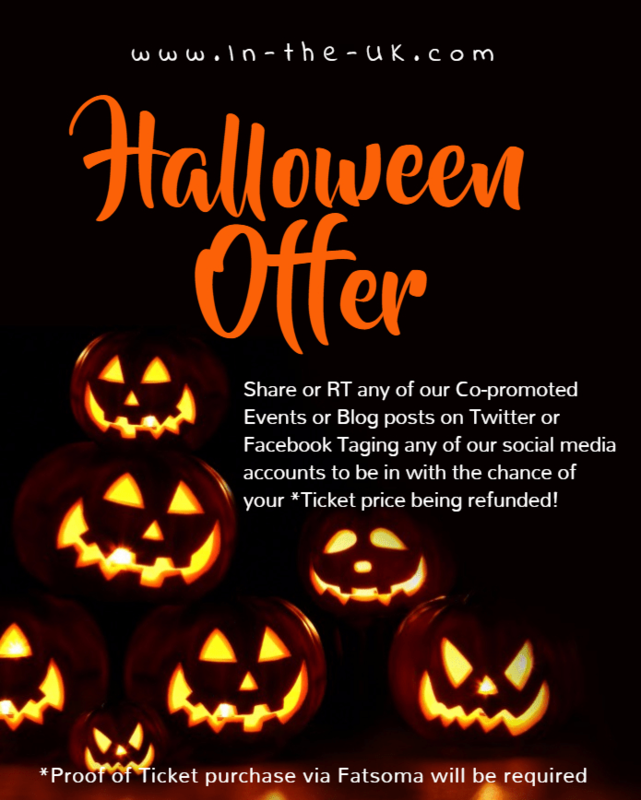 In the UK are co promoting events all over the UK it does not have to be a Halloween event that the Ticket is for, as long as it is purchased through us via our Fatsoma co promotion links. We look forward to being able to refund the cost to one lucky winner come the 2nd of November. By taking part in this Offer you also agree to In the UK announcing you as the winner if you are chosen. If you have any queries with regards to any details please feel free to contact us. *Proof of Ticket Purchase via Fatsoma will be required.